Hirtenberger delivers the type of consistency shooters always look for and this .308 ammo is certainly no exception. These rounds offer a clean, non-corrosive firing experience. Expect smooth cycling through your rifle with no issues. Time and time again customers find this product is top quality and well worth the price at $0.54 cents per round in this 240-round offering. 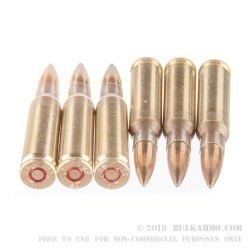 This 146 grain Full Metal Jacket (FMJ) round is magnetic due to the steel in the outer shell. It is fired at 2,741 fps with consistent accuracy at mid-to-long range. The muzzle energy produced is 2,428 ft-lbs. 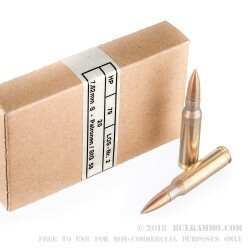 Manufactured to the specifications of the .308 Win ammunition, it can be used in compatible firearms. The casings are non-corrosive Berdan-primed brass and are regarded as some of the toughest and cleanest casings on the market. Produced in Austria, Hirtenberger ammunition is made to exacting standards and will not fail in uniformity. 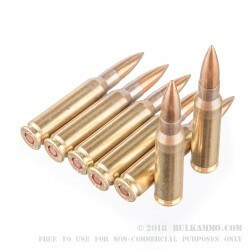 We are proud to offer this effective ammunition at such a reasonable price to our customers. We advise you check to make sure your rifle is compatible with this ammunition. Enjoy your Hirtenberger .308 as we know you will! Know you want to buy a lot of this? 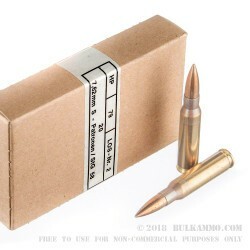 Check out our bulk 960 package of this same .308 ammo for sale here. A: Yes, this is surplus ammo and will have a magnetic bi-metallic covering on the bullet. Q: Do these rounds pass the magnet test? A: Hello Tim, The Hirtenberger ammunition is loaded with a lead core, bi-metal jacket style projectile. Due to the steel content in the projectile, the ammunition will not pass a magnet test.